Ride-hailing firm Grab announced last week that it has launched GrabFresh, an on-demand grocery service, with support from HappyFresh, an online-based grocery delivery company. "Our main goal is to serve more of Indonesians` daily needs, while continuing to improve people`s living standards. 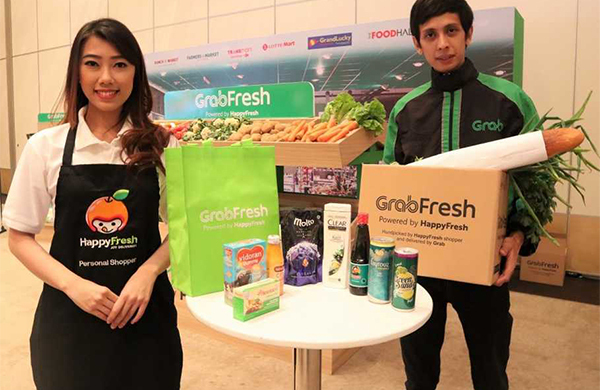 Through GrabFresh, we will create more income opportunities for GrabExpress partners, shipping partners and personal shoppers," Grab managing director Ridzki Kramadibrata said in a statement on Thursday (06/09). GrabFresh seeks to make it easier for Indonesian consumers to shop for their daily necessities, without the hassle of going to a supermarket, getting stuck in traffic, waiting in long queues, or carrying heavy shopping bags. GrabFresh provides consumers with a trained personal shopper, who will select the products they need at the store. "With GrabFresh, we are expanding in the region, and we cannot do it with other partners besides HappyFresh," Grab Indonesia marketing director Mediko Azwar said. HappyFresh has built an extensive network with butcheries, pastry shop, organic food stores and large offline supermarkets, such as Ranch Market, Farmers Market, Lotte Mart, Transmart Carrefour, Super Indo, Grand Lucky, Red & White, The FoodHall, Papaya Street Gallery and LOKA Lifestyle Supermarket. GrabFresh has more than 20,000 items on offer and it is currently working on adding more products and stores. The platform will update daily prices and inventories to ensure no product is out of stock. "We are glad and proud to partner with Grab. With their extensive user base in Southeast Asia, we believe Grab is the best partner to help us grow and develop," said Fajar Budiprasetyo, HappyFresh co-founder and chief technology officer. Jakarta-based HappyFresh closed its operations in Taiwan and the Philippines in 2016, resulting in thousands of employees being laid off or relocated. But the company raised an undisclosed amount in funding to strengthen its business in core markets, such as Malaysia, Thailand and Indonesia. Grab recently has set aside $250 million to invest in Indonesian startups. It will help the startups through a mentorship program, networking and access to markets and technology. The company is competing with local firm Go-Jek Indonesia to expand its operations beyond ride-hailing to cater to growing demand for services ranging from food delivery to financing and cashless payment solutions.